The Mongolian National Democratic Party was the result the original group formed in opposition to the communist regime in 1989. By the 1993 presidential elections, they were working in union with the Mongolian Social Democratic Party. By 1996, this alliance was known as the Democratic Union (Coalition) and won the elections that year. In 2000, the coalition broke up, with some MNDP members leaving to form the Mongolian Democratic Party and the Party of Citizens' Will and the MSDP leaving the coalition. After doing badly in elections during the year, the MNDP and MSDP disbanded and united with three smaller parties to form the Democratic Party. This new party adopted the flag of the MNDP and the logo of the MSDP. For the 2004 elections, the Democratic Party was part of the Motherland Democratic Coalition, along with other groups including the New Socialist Democratic Party. These elections eventually resulted in a grand coalition government. Apparently the MSDP was reformed following a split in the Democratic Party after the elections. I recently saw the Mongolian/German film "The Cave of the Yellow Dog", in which a vehicle drives past the main characters encouraging them to "vote the right way" and flying a fairly large flag. I conclude that the flag depicted in the film and on our site was original the flag of the MNDP, and now of the Democratic Party. Looking back in the archives, Jairg's details concerning the MSDP were only a response to Al's report of the flag from a Democratic Party candidate's website, so there doesn't seem to be any sign that it was used by the MSDP. I suspect that the photo in 2004 showed the flag used to represent the Democratic Party rather than the Motherland - Democratic Coalition it was a large part of, but I suppose it is possible that it was used to represent the Coalition in general. http://www.broadleft.org/mn.htm Leftist Parties of Mongolia, as cached by Google, 12 October 2006. Mongolian People`s Revolutionary Party (MPRP) was the ruling party during the socialist period. After starting democratic reforms MPRP maintains a strong base in the more conservative countryside. In 2010 MPRP was renamed to Mongolia People's Party (MPP), but in that year the new Mongolian People`s Revolutionary Party (MPRP) was created and registered in 2011. The Mongolian People's Revolutionary Party (MPRP) founded on 1 May 1921 (as Mongolian People's Party, renamed to MPRP in 1924), the MPRP ruled the country from 1921 to 1990 as the single political party. The MPRP won the general elections in spring 2008, which caused demonstrations and riot in the country's capital. Description of the former party flag: A blue field bordered on the ends with red vertical stripes approximately 1/6 the length of the flag fly. Centered on the flag is a red star and within the star a yellow circle with a ying-yang symbol. ... I assume that the party changed its emblem when moved from communist ideology (red star) to a socialist one. The old flags was still in their web page about five years ago, then change can happen about 2000. Chapter 1. General principles and articles. Article 2. The party symbol. 2.1. The MPRP has its own symbol and flag. 2.2. 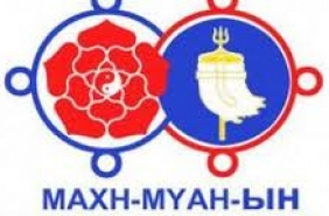 The MPRP symbol has a red rose symbolizing Mongolian "recipe" at its center. The Mongolian "recipe" symbolizes national solidarity and solidarity between senior, middle and young generations of the party. 2.3. The MPRP flag shall be in a vertical form with joint color of red, blue and red. The party symbol shall be placed on middle blue background which is in size of 1/3 of whole flag. Mongolian People's Revolutionary Party (Mongolian: Mongol Ardyn Huv'sgalt Nam) was founded in 2010 after a split in the Mongolian People's Party (Mongolian: Mongol Ardyn Nam), by the members who opposed the party name change and wanted to keep the old name, and was registered next year . The emblem of the new party is derived from the one which the original party used before the name change . The flag is blue-white-green horizontal tricolor with width larger than length (about 2:1), with the emblem in center of the white field [3, 4]. There are also three tongues with pointed endings, placed at the top, center at bottom points of the fly edge, each in the color of the field it is attached to; their length seems to be about the same as that of the main body of the flag [5, 6, 7]. 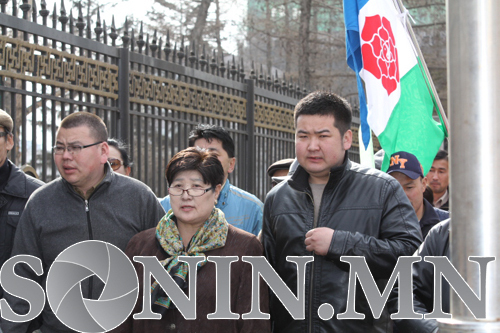 Mongolian People's Revolutionary Party found "Justice Coalition" with Mongolian National Democratic Party in 2012. The new party name (in Mongolian: Mongol Ardyn Nam) is actually the original one, which was used from its founding in 1920 to 1924, when the name Mongolian People's Revolutionary Party (in Mongolian: Mongol Ardyn Huv'sgalt Nam) was adopted. The name change was not accepted by a minority of party members, who broke away in 2011 to found a new Mongolian People's Revolutionary Party, which subsequently adopted a new flag and emblem, derived from those of the Mongolian People's Party. New party emblem and flag were adopted at XXVI Congress in January of 2011. At the Congress delegates include Soyombo -, the national symbol of independence - to their official emblem and flag. "Flag of the Mongolian People's Party is made up of equal size tricolor red, symbolizing the independence of Mongolia and national progress, white, symbolizing justice, solidarity, and purity, blue, symbolizing the eternal blue sky, the national state, and prosperity. The emblem of the party is in the central part of the white field. The ratio of the flag is 2:1 in length and width. Mongolian People's Party, a member of the Socialist International, and as a center-left political party, has a red rose in the emblem". Red rose representing the social democratic ideals. "Eh Oron" (Motherland) movement was founded in the spring of 1999 by businessman B.Erdenebat. "Motherland - Democracy Coalition" (Eh Oron - Ardchilsan Evsel) was formed from "Eh Oron" and the Democratic Party in 2003. In 2004 "The Civil Will - Republican Party" became part of coalition. 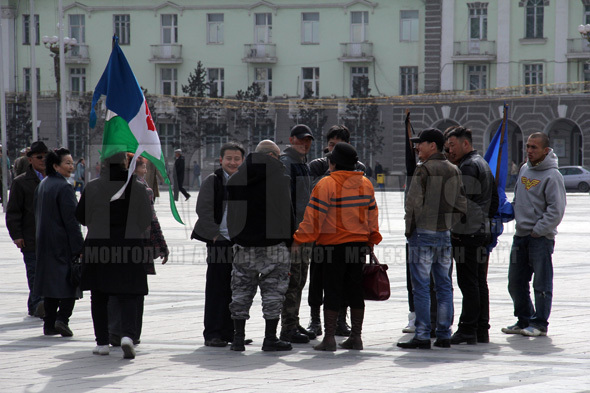 The flag of the Motherland Democratic Coalition is in a 1:2 ratio, just like the national flag of Mongolia. The blue side is the hoist side, and it contains parts of the Mongolian flag symbol in white. ... It is flag of Mongolian Democratic Party (MDP), which was a member of MDC in 2004. Yellow running horse on blue flag. This might be the flag of Motherland Party (Eh Oron Nam), whose logo is the yellow running horse, as can be seen here: http://www.buryatmongol.info/buryat/phpwind/simple/index.php?t13124.html. The party flag could not be seen on the Web so far, but the yellow horse does sometimes appear on light blue background, as can be seen here: http://www.mglradio.com/newforum/index.php?document_srl=583399 Also, according to W.Smith , light blue is Mongolian national color, so the whole design looks quite like the one which the party with such name might use. In 2000 the MNDP and MSDP united with three smaller parties to form the Democratic Party. This new party adopted the flag of the MNDP and the logo of the MSDP. 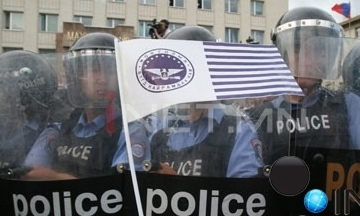 I did notice some mistakes on Mongolian political party flags [at FOTW]. The flags of the Mongolian Social Democratic Party (MSDP) and Motherland Democracy Coalition (MDC) are actually the same flag. It is flag of Mongolian Democratic Party (MDP), which was a member of MDC in 2004. MSDP's flag was quiet different. The flag appears on a photography published in "Courrier International" #421 (26 November 1998), to illustrate a paper originally published in "Far Eastern Economic Review" (Hong-Kong). The legend is "Official delegation and family members attending the funerals of Sanjanzurengiin Zorig, on 7 October 1998." On the left side of the picture appears a partially rolled flag, something like vertically divided blue/red with a thin vertical white stripe in the middle and a white emblem in canton (a triangle below two "rabbit ears"?). I tried to render it as mn-unk.gif. S. Zorig was a member of the Mongolian Democratic Union and one of the leader of the democratic movement of 1990. Perhaps the emblem in the canton was actually the partially visible logo of the Mongolian Social Democratic Party (Mongolyn Sotsial Demokrat Nam), which was inherited by the Democratic Party (Ardchilsan Nam) in 2000 and is still used by it meantime. In 2000, the party merged into the Democratic Party. However, a new Mongolian Social Democratic Party was founded.by some of its old members and registered in 2005, as stated by the list of Mongolian political parties at Mongolian Wikipedia. Its flag is light blue, with the main device of the party logo in center: a Socialist rose on white, in center of a white form with very dark blue edges, shaped like a "triangular Moebius band" (strange sounding description, but the best possible I could come up with), which is charged with party name initials over its bottom segment. The height of the emblem is two-thirds of that of the flag. The best view of the flag is on the photos from a gallery at the party website. A slightly different variant of the flag, with the rose on light blue and "triangular Moebius band" with inner light blue and outer white edges, can be seen in a Picasa photo album. As can be seen, there are both horizontal and vertical variants of that flag. Both of the above galleries are from 2005 or later. However, the party was founded in 2004, as revealed by a Picasa photo album from that year, which shows a different flag, charged with the pre-2000 party logo in white on light blue field. The logo on the flag differs from its standalone version, because its main device is composed of conjoined instead of interlaced strokes. This flag is based on the one used by the party before the 2000 merger, which differed from the 2004 version in much darker shade of blue, as shown in another Picasa album. The photo showing multiple flags was printed in the cover of a booklet issued by the party. The difference between the standalone version of the logo and the one used on flags was the same at that time, as can be seen on the cover on another party booklet. There is also a photo which suggests that the flag might have been charged with the "interlaced" as well as with "conjoined" variant of the logo, but it is not quite clear whether the object displayed on the wall is really a flag or just a wall decoration. That logo was probably abandoned before the party had been registered in 2005, because it was then used - and still is - by the Democratic Party. In 1992 I saw in mongolian newspaper "Mongol messenger" (#52, 29.12.1992) the same flag (but in black-white). It was the flag of Mongolian National Democratic Party. This is People's Revolutionary Party's propaganda banner (?). The actual flag does not have letters in the center but just blue, white, red (2:1:2) horizontal stripes flag proportion is 1: 2, like national flag. "Ündesnii Shine Nam" actually means "National New Party" - as can be seen here: http://www.buryatmongol.info/.../index.php?t13124.html this is another party, not just another styling of the Mongolian People's Revolutionary Party (Mongol Ardyn Huv'sgalt Nam). Consequently, this is the National New Party's propaganda banner. It is not known if this is also the design of the party flag, because no images of it were seen on the Web so far. It is possible, considering the design of the logo, whose larger and more detailed image is shown here: http://202.180.216.30...id=5305. The device in center is the Great White Standard which is mentioned in the Article 12 of the Constitution of Mongolia (see FOTW page mn.html). Mongolian National Democratic Party (Mongol Ündesnii Ardchilsan Nam), which was founded in 2005 as the National New Party (Undesnii Shine Nam) and renamed in 2011. Mongolian National Democratic Party found Justice Coalition with Mongolian People's Revolutionary Party in 2012. The flag of the Mongolian National Democratic Party. The confusing thing is that the device in flag canton looks like a simpler soyombo (only flame, sun and moon), while the party logo displays the Great White Standard, one of national symbols mentioned in the Constitution, as shown here: http://www.ulstur.mn/?p=3465 (Image: http://www.ulstur.mn...). That image shows the logos of Mongolian National Democratic Party and Mongolian People's Revolutionary Party together, because they formed the coalition for the parliamentary election in 2012. Coalition logo shows the logos of Mongolian National Democratic Party and Mongolian People's Revolutionary Party together. Civil Will Party, "The Civil Will - Republican Party"
The Civic Will Party (Irgenii Zorig Nam) - was founded in March 2000. In 2001 it was conjoined with Republican Party � became "the Civil Will - Republican Party". Hereby, I send you the flag of Civil Will Party of Mongolia. The party was founded in 2000 and considered the major third party of Mongolian politics. The CWP symbol constitutes a white falcon with red star in her heart flying in the blue sky. 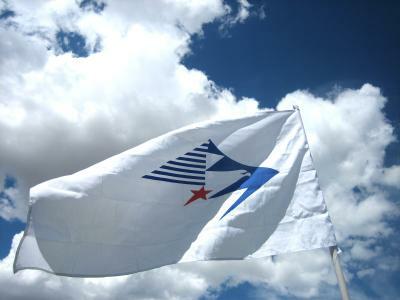 The party flag is white with its logo in the center. This flag was not changed since the party's establishment in 2000. 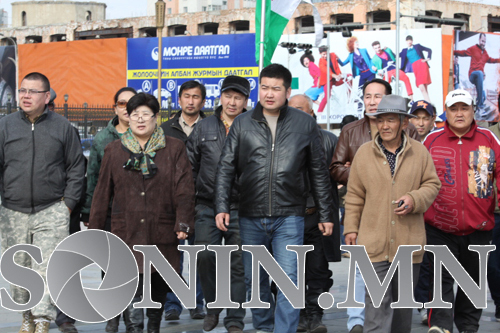 As can be seen here: http://www.chriskaplonski.com/mongolia/parties.html Civil Will Party (Irgenii Zorig Nam) and Republican party (Bügd Nairamdah Nam) have split again in 2004. Their logos can be seen here: http://www.buryatmongol.info/buryat/phpwind/simple/index.php?t13124.html. As can be seen here: http://www.inet.mn/?vfile=5&vmet_id=36571&vmet_main=5001 (image: http://www.inet.mn/ispages/isimage/inetnews/wytai5/36571_63453.jpg) and here: http://electionsmeter.com/polls/civil-will-party (image: http://cdn1.beeffco.com/files/poll-images/normal/civil-will-party_7752_1.jpg) the party flag may be charged with versions of the logo either with or without the party name initials in red. Republican Party was founded by Buyant Jargalsaikhan. In 2001 the Republican Party had merged with the Civic Will Party (and so for a time it was the Civic Will ? Republican Party) and split back off in 2004. I think the situation is more complicated. You will see at these pages http://www.21.gec.gov.mn/service MNN and IZNN together. And MNN uses the yin-yang symbol as its own. Perhaps part of the party members continued to operate independently? Or a new party with the same name and symbols was founded? There seems to have been a similar case: Mongolian Social Democratic Party has merged with the Mongolian National Democratic Party into the current Democratic Party, but there is now also a new Mongolian Social Democratic Party, as well as a Mongolian National Democratic Party, which previously bore another name. Flag of the Civil Will-Green Party is green, with a dark blue triangle bordered in white, which is based in the hoist and extends up to the midpoint of the fly edge. The triangle is charged with a white falcon. The design is probably chosen in order to incorporate elements of flags of the Civil Will Party (white falcon on blue) and the Mongolian Green Party (green field). 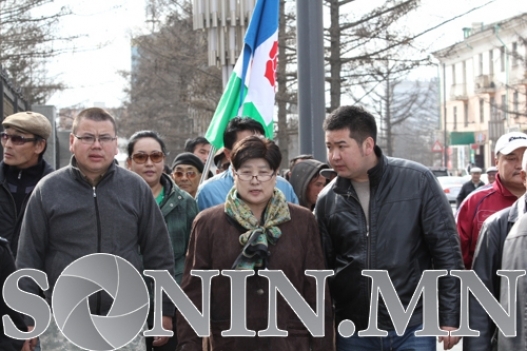 Lots of images of Labor Party of All Mongolia symbols at their Facebook gallery. As shown there, they also seem to have both vertical and horizontal tribands as their flags.